All cars and trucks require regular maintenance in order to ensure a long road life, but one service is necessary much more frequently than things like power steering fluid flushes or belt & hose inspections. Oil changes are necessary for most cars between every 3,000 and 10,000 miles in order to provide the necessary protection from friction that the engine needs. In the long run not completing oil changes will lead to major engine damage which may cause the motor to seize and need replacement or a full rebuild. Regular oil changes will prevent that from happening because of oil's ability to do the following three important tasks. Oil is engineered to have the ability to absorb heat produced by the engine. The absorption of this heat works simultaneously with the cooling system to ensure the engine does not overheat, which could lead to problems such as burnt valves or blown head gaskets. As oil ages it breaks down and loses its ability to do this and can actually reflect heat instead, increasing the possibility of overheating issues. During general operation dirt, dust, metal shavings and other contaminants make their way into the engine. As the oil circulates through the motor it collects this debris, turning the oil from a smooth liquid to a muddy substance that can create operational difficulties for the motor which will result in a drop in power and fuel efficiency. As the oil passes through the oil filter much of this gunk is remove from the engine. But as the filter collects more and more it becomes difficult for clean oil to pass through, which may lead to oil starvation in the engine. During an oil change this sludge is drained from the engine, essentially cleaning it out, and when new oil is added power and MPGs are restored! The most important role of oil is to provide the lubrication necessary to prevent metal parts from rubbing on each other. If there is friction between the moving parts of the engine they will quickly wear down, causing major problems for your vehicle that in order to fix will likely end up requiring an engine rebuild or replacement. The more miles that oil is used the less it is able to properly lubricate the engine, especially due to the amount of grime that it collects. Oil changes are necessary to ensure lubrication is taking place and that oil is not being lost to a leak or being burnt up in the combustion chamber. Never skip oil changes or you put your car at risk of major engine damage. This maintenance will save you much money in the long run and the service does not take long at all when completed by an expert team of mechanics! For an expert oil change in Asheville for any make or model, head to The Organic Mechanic. 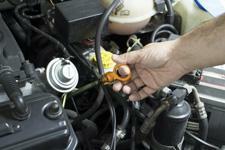 We offer professional auto maintenance that is a great alternative to expensive dealer services. Give us a call at (828) 232-8120 to schedule an appointment for auto maintenance in Asheville today.